Download "Moving through Conflict to Collaboration"
2 prefer to be left out of the conversation, leaving the decision to a manager s discretion. These and other differences provide a variety of filters through which to view a given task and ways of moving it forward. By fostering a collaborative process in which all the possibilities are thoroughly considered and tested, it is more likely that a consensus can ultimately be reached and teamwork enhanced in the process. Of course, we each bring our own personal sense of reality to any group effort. Innovative outcomes are dependent upon unique combinations of perspective and approach. Collaboration also requires that we develop a shared sense of reality. By cultivating common goals, values, and basic project management procedures at the outset of a team-based project, divergent perspectives can be more easily tolerated or embraced. Uniting around common ground is a framework that enhances a group s ability to resolve or respectfully manage differences when they inevitably arise. When such a group identity exists, computer savvy employees may be more patient with colleagues who are wary of new information technology applications. Those who wait for direction may also be more accepting of those who constantly press for change as long as all concerned feel their perspectives are being considered and valued. Regardless of how prepared a team is to face conflict, various types of conflicts are sure to arise. Karen Jehn and her colleagues have identified three major types of workplace conflict (Jehn, 1997; Jehn & Mannix, 2001). These include task, process, and relationship conflicts. Task conflict involves differences centered on work details and goals. This type of conflict is often the easiest to address and resolve and often enhances dialogue and debate regarding how work is conducted (Lipsky & Avgar, 2008, p. 179). Such conflicts can result in a better understanding of how things are actually done in the organization and the manner in which they should be done (Lipsky & Avgar, 2008, p. 179). Process conflict includes controversies about aspects of how task accomplishment will proceed (Jehn and Mannix, 2001, p. 238). This kind of conflict is considered to be distinctly different from the other two types and to operate on a whole other set of dynamics (Lipsky & Avgar, 2008). These usually concern disagreements about how task accomplishment should proceed in the work unit, who's responsible for what, and how things should be delegated (Jehn, 1997, p. 537). This type of conflict can be most productive when it is minimized by clearly defining goals, roles of participants, and task management procedures early on. Relationship conflicts are those that arise over disagreements and incompatibilities among group members regarding personal issues that are not task-related (Jehn, Greer, Levine, & Szulanski, 2008, p. 467). This is often regarded as the most challenging type of conflict to deal with. Unresolved conflict of this nature has been found to undermine cohesion, trust, satisfaction, and performance of a work group. Recent research (Desivilya, Somech, & Lidgoster, 2010) has suggested that relationship conflict must be quickly detected and resolved. This study found that persistent relationship conflict to be negatively associated with the development of collaborative problem solving patterns in work teams. Many of the suggestions offered below are designed to address this type of conflict. 4 support or even passive resistance having felt excluded from the process (by virtue of his or her own withdrawal). When concern for another s needs exceeds the concern for one s own needs, this can lead to the use of an obliging style. A person who uses this style will tend to be highly cooperative and unassertive. Differences may be ignored while areas of common ground are emphasized. This can eventually lead to a lack of critical review of team outputs. For example, a task force member may readily agree with every idea proposed by an outspoken colleague or decline to offer his opinions for fear of arousing disapproval. Over time this person s perspective is likely to be ignored even if he is aware of vital information to which no one else on the team is privy. The accomplishments of the team may be compromised as a result. A compromising style represents an intermediate level of self-advocacy and concern for others. While this may lead more easily to acceptable outcomes for all involved, there may be so many concessions on both sides that all parties are left feeling somewhat unsatisfied by the results achieved. Too much compromise can stifle innovation. For example, a team member may quickly agree to abandon her efforts to seek a promising grant she was excited to pursue because another member thinks it would take too much time. The other agrees in return to discontinue offering a service he feels passionate about because his co-worker doubts there are sufficient funds to support it. Further discussion and consideration of both team members needs and interests may have led to a far superior result, but in this case, that possibility was sacrificed in the interest of being cooperative. 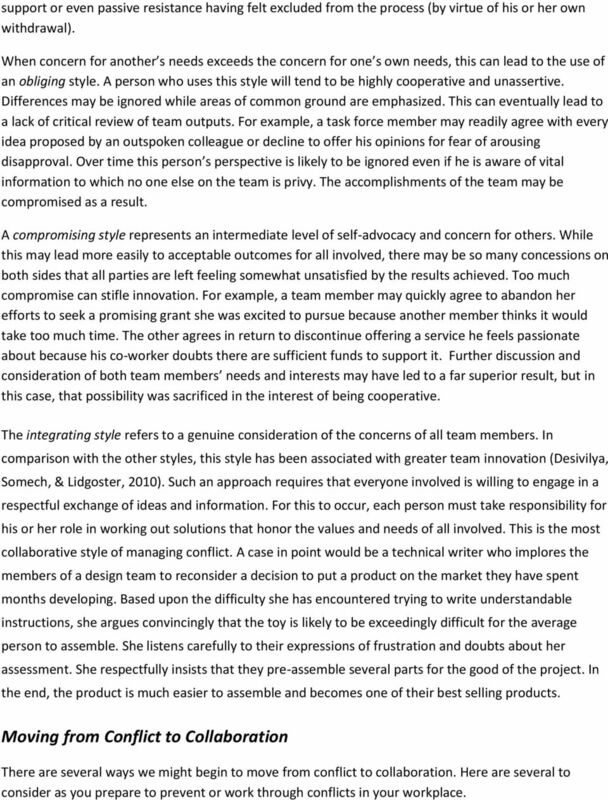 The integrating style refers to a genuine consideration of the concerns of all team members. In comparison with the other styles, this style has been associated with greater team innovation (Desivilya, Somech, & Lidgoster, 2010). Such an approach requires that everyone involved is willing to engage in a respectful exchange of ideas and information. For this to occur, each person must take responsibility for his or her role in working out solutions that honor the values and needs of all involved. This is the most collaborative style of managing conflict. A case in point would be a technical writer who implores the members of a design team to reconsider a decision to put a product on the market they have spent months developing. Based upon the difficulty she has encountered trying to write understandable instructions, she argues convincingly that the toy is likely to be exceedingly difficult for the average person to assemble. She listens carefully to their expressions of frustration and doubts about her assessment. She respectfully insists that they pre-assemble several parts for the good of the project. In the end, the product is much easier to assemble and becomes one of their best selling products. Moving from Conflict to Collaboration There are several ways we might begin to move from conflict to collaboration. Here are several to consider as you prepare to prevent or work through conflicts in your workplace. 6 integrative or compromising styles may sometimes lapse into withdrawal or attack mode, even you! This tends to occur when someone is struggling to express what feels deeply important in terms that others will be able to understand. Anyone in this fix will tend to feel helpless and frustrated until it becomes possible to succeed in articulating one s perspective effectively. Take breaks to regroup. When you suspect others are struggling in their efforts to express themselves, acknowledge it. You can open the door to mutual understanding and trust by saying something like, It seems there is something really important you need to say about this. I propose we take a short break so you can organize your thoughts and I can clear my mind to listen so we can work this out together. You might even establish an agreement when your group meets for the first time to take breaks to regroup as needed. This can greatly improve everyone s chances of keeping a sense of perspective and maintain the capacity for creative problem solving. By being proactive, you are more likely to avoid the development of intractable conflicts from the outset. Distinguish between intentions and impact. If you do become entangled in a heated exchange, you can begin to get back on track by differentiating between your intentions and the impact of your comments and actions. Mishandling these is one of the biggest factors leading to intractable conflicts. Claiming to know another s intentions inevitably ends in deadlocked conversations. Ignoring or denying the impact of your words and actions on others is also sure to lead to lose-lose situations. 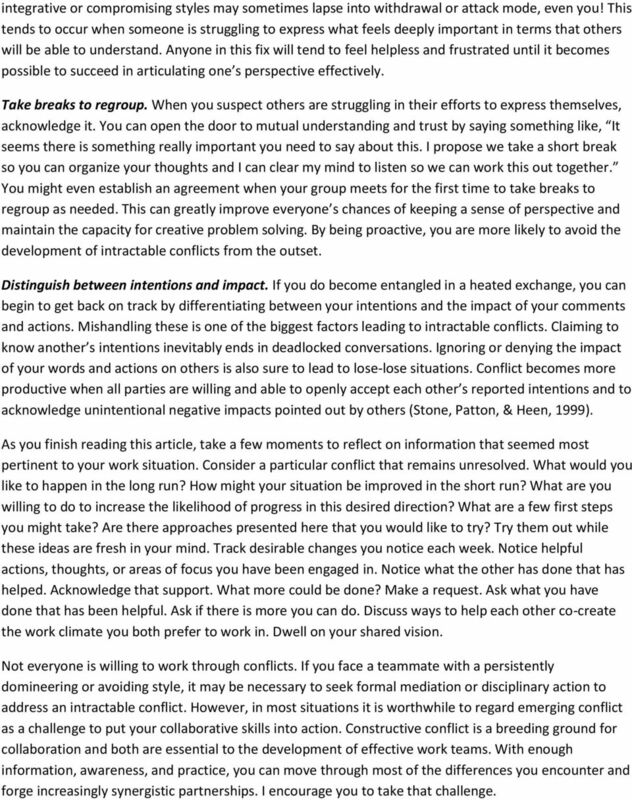 Conflict becomes more productive when all parties are willing and able to openly accept each other s reported intentions and to acknowledge unintentional negative impacts pointed out by others (Stone, Patton, & Heen, 1999). As you finish reading this article, take a few moments to reflect on information that seemed most pertinent to your work situation. Consider a particular conflict that remains unresolved. What would you like to happen in the long run? How might your situation be improved in the short run? What are you willing to do to increase the likelihood of progress in this desired direction? What are a few first steps you might take? Are there approaches presented here that you would like to try? Try them out while these ideas are fresh in your mind. Track desirable changes you notice each week. Notice helpful actions, thoughts, or areas of focus you have been engaged in. Notice what the other has done that has helped. Acknowledge that support. What more could be done? Make a request. Ask what you have done that has been helpful. Ask if there is more you can do. Discuss ways to help each other co-create the work climate you both prefer to work in. Dwell on your shared vision. Not everyone is willing to work through conflicts. If you face a teammate with a persistently domineering or avoiding style, it may be necessary to seek formal mediation or disciplinary action to address an intractable conflict. However, in most situations it is worthwhile to regard emerging conflict as a challenge to put your collaborative skills into action. Constructive conflict is a breeding ground for collaboration and both are essential to the development of effective work teams. With enough information, awareness, and practice, you can move through most of the differences you encounter and forge increasingly synergistic partnerships. I encourage you to take that challenge. 7 References Desivilya, H. S., Somech, A., & Lidgoster, H. (2010). 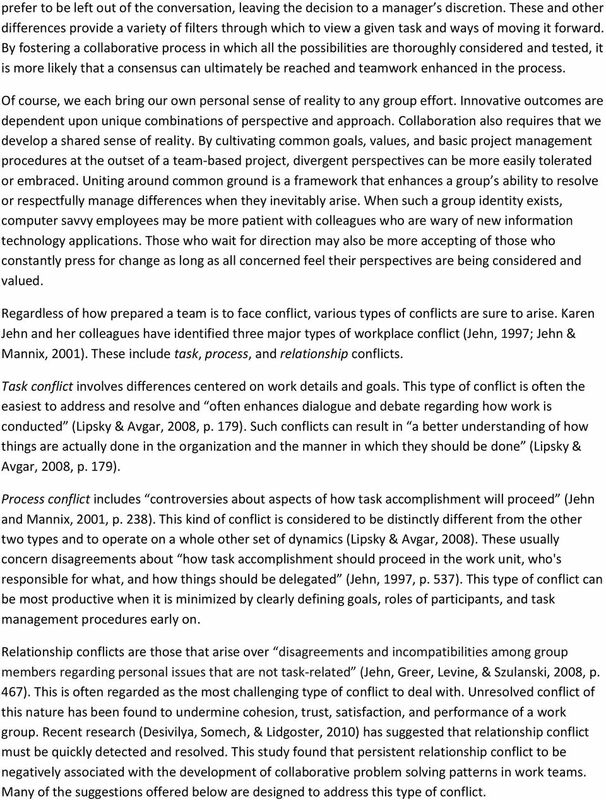 Innovation and conflict management in work teams: The effects of team identification and task and relationship conflict. 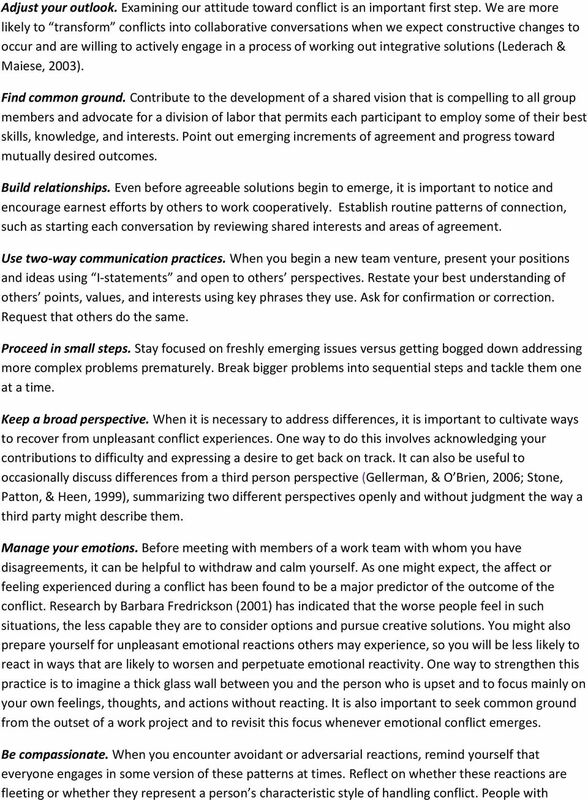 Negotiation & Conflict Management Research; 3 (1), Fredrickson, B. L. (2001). The role of positive emotions in positive psychology: The broaden-and-build theory of positive emotions. 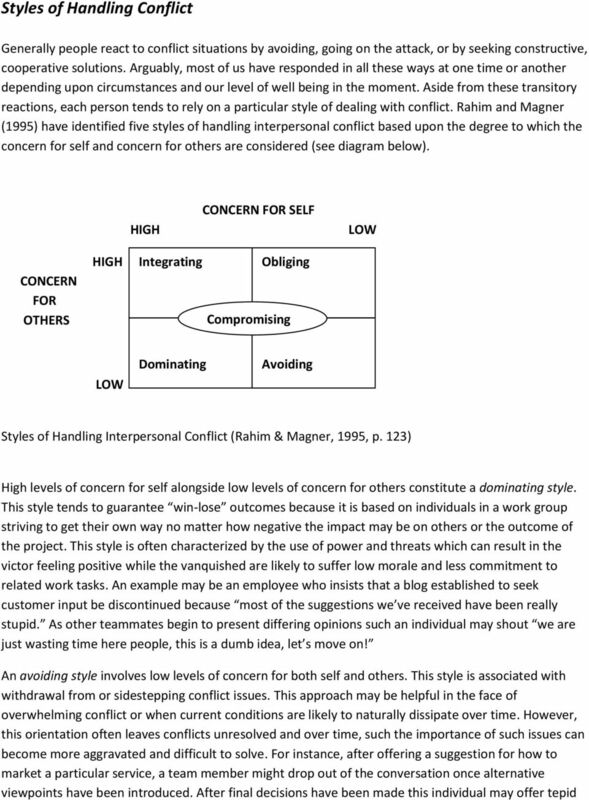 American Psychologist, 53 (3), Pp Gellerman, C. & O Brien, K. C. (2006) Resolving conflict from the third side. (In R. MacNair (Ed. ), Working for peace. Atascadero, CA: Impact Publishers.Pp Jehn, K.A., Greer, L., Levine, S., & Szulanski, G. (2008). The effects of conflict types, dimensions, and emergent states on group outcomes. Group Decision & Negotiation, 17, Jehn, K.A., Mannix, E. (2001). 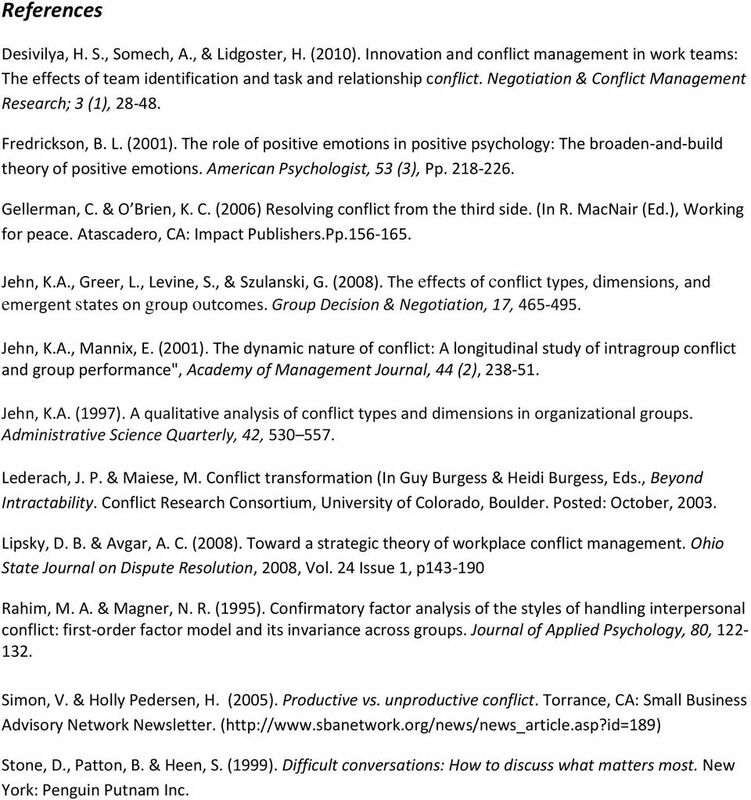 The dynamic nature of conflict: A longitudinal study of intragroup conflict and group performance", Academy of Management Journal, 44 (2), Jehn, K.A. (1997). 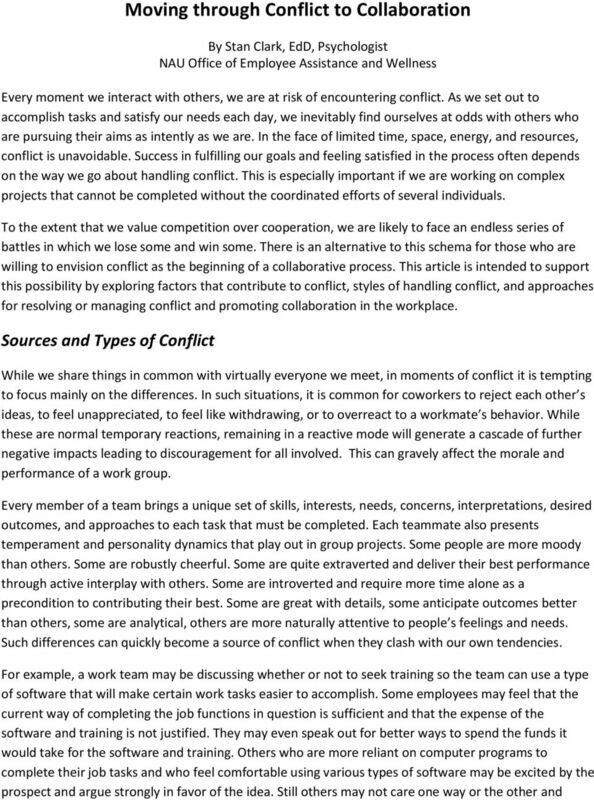 A qualitative analysis of conflict types and dimensions in organizational groups. Administrative Science Quarterly, 42, Lederach, J. P. & Maiese, M. Conflict transformation (In Guy Burgess & Heidi Burgess, Eds., Beyond Intractability. Conflict Research Consortium, University of Colorado, Boulder. Posted: October, Lipsky, D. B. & Avgar, A. C. (2008). Toward a strategic theory of workplace conflict management. Ohio State Journal on Dispute Resolution, 2008, Vol. 24 Issue 1, p Rahim, M. A. & Magner, N. R. (1995). Confirmatory factor analysis of the styles of handling interpersonal conflict: first-order factor model and its invariance across groups. Journal of Applied Psychology, 80, Simon, V. & Holly Pedersen, H. (2005). Productive vs. unproductive conflict. Torrance, CA: Small Business Advisory Network Newsletter. ( Stone, D., Patton, B. & Heen, S. (1999). Difficult conversations: How to discuss what matters most. New York: Penguin Putnam Inc. Opens discussions effectively Establishes a clear and compelling rationale for resolving the conflict. Having Conversations at Work that Work! Conflict Resolution INTRODUCTION TO CONFLICT People have different thoughts and feelings about conflict. Those thoughts and feelings are usually a result of our personal and professional life experiences. THE BEHAVIORAL-BASED INTERVIEW When interviewing candidates for a position at your facility, it is important to remember that it is important to ask questions beyond what can be found on a Curriculum Vitae. Conflicts of various types are a natural part of the team process. The Leadership Star: Qualities in Action. For internal use only. Not for use with customers. Table of Contents I. Introduction II. Effective Communication Activity #1: Listening Inventory III. Active Listening Skills IV. Examples of Effective Communication V. What Defines a Respectful Relationship? FORM 1 This competency self-assessment process is designed to help you identify your areas of strength and areas for development as a leader/manager in the Public Service of Newfoundland and Labrador. Team Building. HR can provide you with support for building effective team work. ACCOUNTABILITY/DEPENDABILITY Provide a specific example that best illustrates your ability to be counted on. Tell us about a time when you took responsibility for an error and were held personally accountable. The Five Dysfunctions of a Team A Leadership Fable Patrick Lencioni San Francisco: Jossey-Bass (2002). Teamwork ultimately comes down to practicing a small set of principles over a long period of time.